Warren Gill, School of Agribusiness and Agriscience faculty, in one of the Science Building labs for the EXL Magazine. Dr. Warren Gill has spent his career using farmer’s instincts and academic detective work to keep Tennessee’s cattle healthy. It was Gill who, in the early 2000s, got to the bottom of a mysterious illness that had been plaguing Tennessee-bred calves. Then a member of the University of Tennessee’s agriculture faculty, he linked the affected herds’ rough coats to a copper deficiency. When he tested their forage, the results were puzzling: it was low in copper, but also extraordinarily high in sulfur. After four years spent gathering samples throughout Tennessee and into Kentucky, Gill identified the culprit: coal-burning power plants. Years later, that discovery would lead Gill to an improbable partnership with a geneticist from Vanderbilt University School of Medicine. Now their work together has taken on new dimensions—global, human, and life-saving. And it’s all part of their effort to build a better cow. Fixing copper deficiency in cows is relatively easy, Gill says; you adjust their mineral supplements. What isn’t easy is getting liver samples from cows to test for copper deficiency. For years, however, that was the only good option. The problem was solved and a research partnership born in 2012, when Gill—who by then had joined MTSU’s School of Agriculture and Agriscience—met Dr. James West, a Vanderbilt specialist in gene editing. Together they developed a skin test for copper deficiency using blood, skin, and liver samples from affected cows. When Gill and West collaborated again, they were focused on a far greater need. It was 2013, and Gill had just attended a conference where ranchers and farmers discussed the challenges of developing livestock that could withstand the scorching temperatures typical of so many of the world’s impoverished regions. The Brahman cattle raised there are inefficient breeders and grazers relative to the amount and quality of the beef they produce; however, they’re heat-tolerant, with short, white coats. Angus cows, bred for cooler climates, are the opposite in every way, down to their tender, abundant beef and double layers of long, black hair. Gill floated the idea to West, who signed off on it. By November 2015, the first fertilized white Angus eggs were ready for transfer to their bovine incubators. If the transfers take and the pregnancies are viable—Gill is hoping for 25 percent success—the calves will be born midsummer on his farm in Petersburg, Tennessee. They’ll share traits of three breeds: the Angus; the Silver Galloway, a heritage breed with darker skin and long, white hair; and the Senepol, a slick-coated breed famous for its heat tolerance. Gill has seen plenty of calves born—after all, he was raised on the farm he now runs—but he’ll witness these births, too. Meanwhile, the researchers are incubating a new business, Ag Genetics, which will market the technology—such as the copper deficiency test—for which MTSU and Vanderbilt hold the patents. Black Angus at the MTSU Farm at Guy James. Friedman is now working with West and Gill on that application, one the men hadn’t anticipated. West notes that they used testicular stem cells simply because it seemed a cost-effective option. “It’s hard to predict the direction research will take until you follow it to the end,” he said. 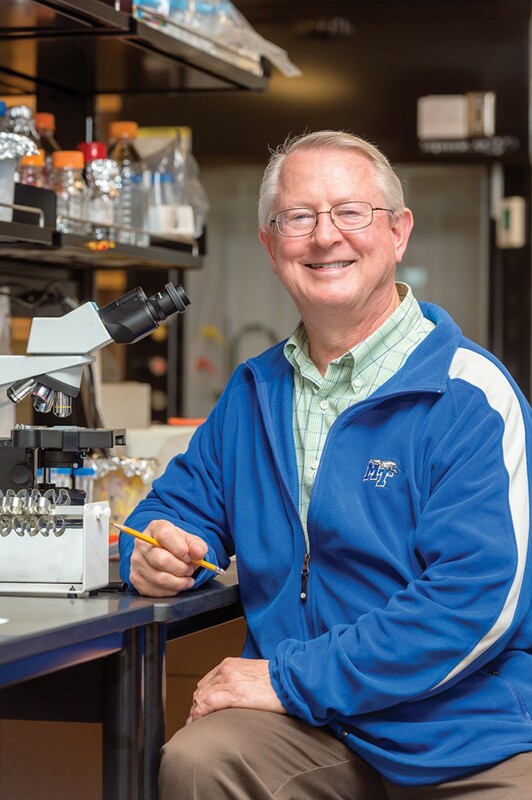 That journey is one Gill has gone all in for, even stepping down as director of MTSU School of Agribusiness and Agriscience, in order to have more time to pursue this life-saving research. 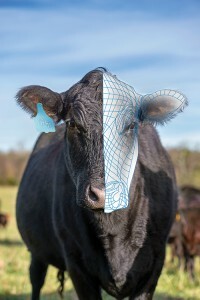 What began as an inquiry into nutrition deficiencies in cattle has rapidly expanded into a multi-faceted research project, a new business, and, possibly, a new breed of bovine. With so much potential, there’s no end in sight.